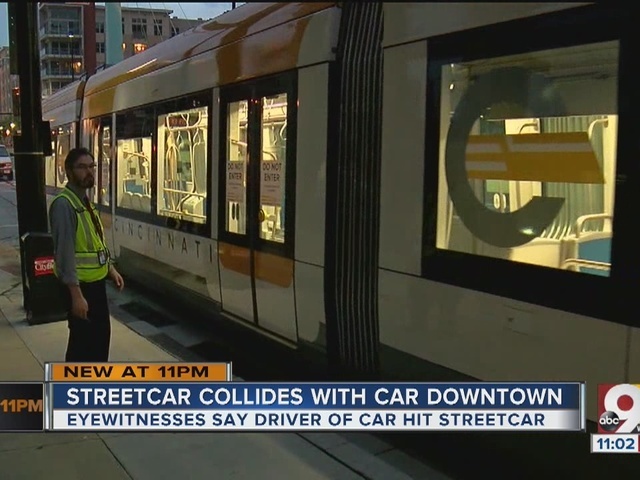 CINCINNATI -- A car collided with a Cincinnati streetcar Monday night on Third and Main streets Downtown, damaging both vehicles and sending one person to the hospital. “You ever been over to the scrapyard and heard them over there strapping the metal? That’s what it sounded like,” said Van Estill, who witnessed the wreck. The streetcar has been in testing now for several months, and there have been a few incidents where there were "minor brushes," streetcar spokesperson Sallie Hilvers said. "This so far is the only accident of this magnitude that has involved the streetcar," she said. Estill said the streetcar had the green light and was coming from The Banks when the wreck happened just after 7 p.m.
“I don’t know if (the driver) wasn’t paying attention or if she was trying to beat the red light, but she pulled out in the intersection,” Estill said. A traffic sign near the crash site reads "no turn on red." The driver was hospitalized. The extent of the driver's injuries is unclear; the streetcar operator was unharmed. There are cameras on the front of the streetcar. Officials said video from those cameras will help the Ohio Department of Transportation with its investigation. As standard protocol, the streetcar driver was taken for a mandatory drug and alcohol testing after the crash. The streetcar is scheduled to open its doors to public passengers in early September, provided it passes all safety tests. Hilvers urged drivers to be careful of the streetcar's presence in Downtown traffic. “We are putting videos out and we are putting safety information out to remind people to be careful around the streetcar. The streetcar cannot get out of your way," she said.